Mark Deuze starts, in the introduction of his book, to argue that most students that follow studies like; journalism, advertising, games, film and television have lack of knowledge on managing their media work and industry. They know, for instance, exactly how to design a new game but ‘they are not empowered to understand how and why the industry works the way it does’ (p. x). They know too little on what the challenges and threats within these big industries. With this bundle of essays, Mark Deuze gives an overview of how these different industries coping with changes and challenges in society that are affecting them. Mark s Deuze is a communication professors in the Leiden University Centre for Linguistics in The Netherlands. He is also works at the department of Telecommunications at the University of Indiana. The book divides the essays into four parts; management and the creative industries; media work, policy, and economics; media professions (which is divided into four sub-parts; journalism; television and film; advertising, public relations, and marketing communications; new media work); and last future perspectives. In the first part Deuze and Steward elaborate on management in theory and they make clear in which context this book is written. To understand management of media you should first consider media relationships at the macro, meso and micro levels. With this framework at hand to book continues on management and the creative industries. Bozena shows that today’s ‘conceptual frameworks of media management research draws are based in organizational studies’ (p. 13). But the field of media management is distinctive in many ways; it information product instead of tangible products; differences in demand, production and market; and most important media products have extremely high social values. She underlines this argument by showing an overview of management theories that are use in media management. Chris Bilton continues and argues that we need to recognize that both creativity and management are complex processes. We need to connect these two in organizations, education and cultural policies in the right context of media; ‘managers need to connect creative thinking to their strategies and organizations.’ In the last essay of the first part Lucy King explains how we need to maximize innovation in media organizations. She suggests through the use of new technologies and adapting to them, media managers are better prepared for the future. Besides, you should forget the ‘mass’ and understand autonomy. Terry flew starts in the second part with theories of John Maynard Keynes, Joseph Schumpeter and Karl Marx. He gives us an overview of how the political economy is working in the media landscape. With the help of Marxist critique of capitalism, he reminds us of the ‘extent to which the market itself will not redress questions of inequality of access on a national or global scale’ (p. 70). Even, though, digital media technologies nowadays provide us with the ideas of co-creations and giving the consumer more power. Chapter six elaborate on deregulation of the media sector and how the traditional dynamic between the media and their audience is changing. This is because of the rising of the Internet and new communication networks. Media has always been a key factor in democracy and by deregulating it; it is setting new rules on normative goals of media. With this in mind, labor is changing as well according to Toby Miller. He sketched how American labor went from the assembly line, to out-sourcing of labor and the rise of the Creative Industry. In this new industry he defines several new groups of workers including; creators, impresarios and critics. The third section is divided into four sub-parts; journalism; television and film; advertising, public relations, and marketing communications; new media work. In the first part the authors argue the rise of a new era where journalist, instead of producing a single outlet, need to multi task between different kinds of media. Singer gives an overview on how the journalism culture has changed throughout the past decades. Deuze extent on this new culture and describes that journalist convergence; reporters and editors becoming the same persons. Besides, he sketches the rise of the ‘prosumer’ and how this affects the quality of news. The latter, leads to a lot of second hand news because they are copying each other. The newsworthy of the information dies because of the huge amount of information that is on the Internet. In chapter ten, Pablo Bocskowski elaborates on this fact and this leads to homogenization of the news. With big multinational media company’s out there, Tim Marjoribank reminds us that the local context, where they are operating in, is still very important. He gives us a wise lesson for management that they use global technologies but they operate in local cultures which they need to understand. The second sub-part is about how technology has changed film and television. Keith Randle states that new technologies have changed the individual creative media worker. Managers have to work more and more in an individualistic environment. Alisa Perren shows us that, due piracy and the Internet, marketing is becoming extreme important of workers in media productions. In chapter fourteen, Charles Davies explains that more and more workers are self-employed, specialized and flexible. Chapter 15 gives us the ‘rise of the entrepreneurial self’ and the conflict between on one hand the organization around the interest of older, unions and conglomerates. And on the other hand the unscripted young professionals and new media technologies. Chapter 16, 17, 18 and 19 gives the reader an inside into advertisement and management. Advertisement is a mediator according to Liz Mcfall, it mediates between social, culture and aesthetics (p. 193). Further, Sean Nixon explains new advertisement businesses, which rely on strategic partners and ‘integrated into the heart of their clients businesses’ (p. 207). Chris hackley and Amy Tiwsakul argue that advertisement agencies need new skills because of new technologies. On the one hand media convergence but at the same time there are more and more devices and ‘spaces’ where there is the possibilities to advertise. As a result, agencies lack specific skills and they need to rely on their networks. The online world, with his communities, is a rich source for companies to monitor their product. It is necessary to manage these communities and to monitor them, both national and global. In this way the companies can monitor their audience in a more anthropological way instead of quantitative analyses. According to Marina Vujnovic and Dean Kruckeberg management is thus becoming more complex. Alphre Kerr describes a framework on the culture of game work. In the game industry you need a team of developers, a publisher and a console company to create and distribute a game. Trends in this sector are; co-production, vertical integration, use of digital networks and a young work force. Eric Harvey explains how management must cope with copyrights and all its facets. In the contemporary society independent companies are better prepare on this problem of copyrights. They are flexible, non-hierarchical and can react ad hoc on new changes. This is precisely what companies need in a networked Internet environment. ‘Life is a pitch’ is central to the argument of Rosalind Gill. She sketches 10 key features of new media work wherein self management is important. The authors of the last two chapters give a glimpse of the future of management of media companies. Annet Aris describes six changes in the new media age i. a. content will be everywhere and it will be free of use. She argues the need of new skills and an open network approach of companies. The last chapter of this book is about organized network. The authors, Geert Lovink and Ned Rossiter elaborate that networks can’t be managed because they are not goal driven; instead they rely on shared issues (p. 282). 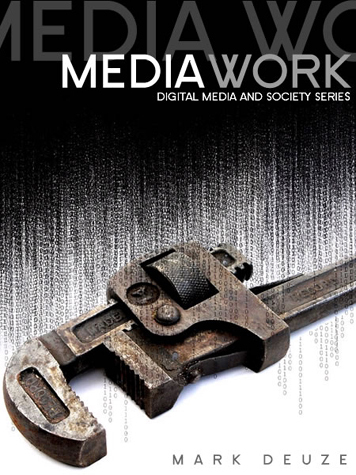 This book gives an interesting overview of theories and practices of managing media works in contemporary society. 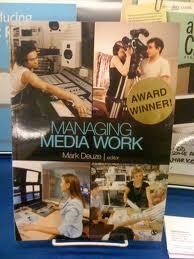 By reading this book it gave me, as a MA new media student, a clear overview and a framework on how media works nowadays. It gave me more than just theory about media works; it gave advice and showed how companies coped with adapting to change. Besides it described how the new media worker looks like and with what kind of threats and challenges he/she will be working with in the future. I missed, although, sometimes a critical comment of the authors on these new media technologies, especially on the notion of an active audience and ‘UCG’. It is not that bright as some of the authors describe. One key thing that is clear for me is that we go to an individual society wherein small media companies work together, relying on their global networks, on project based assignments where self management of the worker is central.